I’ve been fairly candid on this blog about my past struggles with depression and anxiety. My confessionals have always been based on events from more than a decade ago. I was fortunate to enjoy a very long stretch completely void of any issues whatsoever. However, as anyone who has struggled similarly knows, the “cure” is rarely permanent. I started recognizing early signs last summer. My agoraphobia was starting to make decisions for me. I hadn’t seen many friends in months. Other than trips to the family cottage on the weekends, I rarely left my house. I wasn’t even making short trips to the grocery store anymore. Christmas, with all of its demands, was a full 3 week meltdown. By February, I was being questioned about my health and whereabouts. It was time to do something. Included in my list of anxieties, white coat syndrome. Not wanting to leave my house, and REALLY not wanting to see a physician were fairly large obstacles to overcome. It turns out that my new doctor is incredibly amazing. The whole office is wonderful. It felt good to find people who truly want to help. I was prescribed a temporary medication (6-12 months) that should “reboot” my serotonin levels again. That would be great if the meds didn’t first involve a month-long adjustment period. I went from not leaving the house because I was mentally ill, to not leaving the house because I was physically ill. I couldn’t write a word for 3 weeks. Happily, I have now adjusted. While my blog is still suffering from my absence, at least I’m getting Mayhem Genesis back on track. I also managed to get out a few times in March. I saw Patton Oswalt perform, had dinner with friends I was missing, and even got to enjoy some live music. For my birthday a few weeks ago, my husband gave me a new camera. I cannot wait to get out some more and play with my new toy. The weather is heading in the right direction, and so am I.
Ironically, the very first picture I took with my beautiful gift was the featured photo of my cat, who adamantly did not want to come out of his box. I can totally relate, little dude. Did you know that a fresh hairball can and will squish up between your toes? I mean sure, yeah, you would expect this if you stepped into a pile of straight cat puke, but a hairball? Not that I think about it often, but I would have imagined that the hair would act as a screen from it getting past the bottoms of your feet. I would have been wrong. As an added bonus, the fun doesn’t end once you’ve cleaned between your swampy toes – you still have to remove the cat hair from the drain. The worst part about it? I saw the hairball. Now I haven’t slept well in 3 nights. I’m accustomed to falling into a coma-like state. I sleep hard… usually. I don’t know why this week has been an exception, but even in my groggy frame of mind, emerging from my bedroom for the first time today, I saw the hairball on the stairs. I walked past it to fetch cleaning supplies and take care of it. Unfortunately, as I was bent over rummaging through the cupboard of cleaning supplies, I smelled something faint, but awful. I thought it was coming from within that cupboard. Great, something else I have to clean, I bitched to myself. I grabbed what I needed from the kitchen and headed back toward Mount Hairball. However, the smell didn’t fade as I moved away. It stayed exactly the same. I gathered my robe in my hands, put it close to my face and inhaled deeply. I wish that I had noticed the small, dried Chihuahua turd stuck to my robe, touching the side of my right hand, BEFORE I jammed that stink into my face. I already had a paper towel handy so I removed the poo (while gagging on the stench and imagining that vile bacterial creepy crawlies were invading my hand) and fled to my room to change my clothes. My animals get very excited when I first wake up. When I don’t give them immediate attention, a frenzy begins. On this morning they had waited longer than they wanted to wait. They were not thrilled when I disappeared again before doling out lovin’. So, when I came back out of my room there was a herd of cats tearing up and down the stairs. The largest of them, Julius, rammed his head square into the back of my calf causing me to stumble… directly into HIS disgusting hairball. It unfolded in slow motion. I did everything I could to avoid that landmine, but just didn’t have enough control over my body, and SPLAT. I sternly warned them all to “get downstairs, go lay down!” and went into the bathroom to wash my hands, face and foot. I then grabbed more paper towel and made my way back to the festering pile of hairy vomit when… I stepped in pee. My “go lay down” tone literally scared the piss out of my dog. She tinkled a little on the stairs. THAT I didn’t see coming. No, that one was a warm, fresh surprise. Once again, with a paper towel already in hand, I began cleaning up my foot. I returned to the tub and for the second time in a handful of minutes, gave my right foot a bath. AGAIN, I fetched paper towel and headed toward Hairball Hill. With that attempt, I actually got it cleaned up, the pee too. I hadn’t even had coffee yet when this fiasco began, so I thought I’d sit for a second to collect myself. I found the little hellions all sleeping soundly, occupying nearly every inch of seating in my living room. That blanket covered thing in the picture, that’s my new couch. I don’t remember what it looks like though. The animals like it even more than I do, so the blankets have been there since 5 minutes after the couch arrived. Voodoo: One of many incarnations of African-based spiritual folkways rooted in West African Dahomeyan Vodun. Also, my kitty, the one in the featured image. If you have read my short story titled Cooper the Cat, Voodoo is first introduced there as one of the surprises that Cooper had in store for us. I knew almost immediately after Voodoo was born that we would keep her. She picked me. She was the only kitten that didn’t run from my hand the first time we were allowed to touch them. On the contrary, she clumsily made her way toward it and played with my fingers. She was the runt of the litter. For a while, we weren’t sure she would make it. She was dropper fed for a period of time. Back then her name wasn’t Voodoo. Initially she was “Poe”. It felt a bit like a boy’s name so for a brief time we went with “Rogue” instead. It didn’t really suit her so soon after she got her permanent name, Voodoo. There is a potion popular to Louisiana Voodoo called “cure-all”. Jimson weed (which is highly toxic, so don’t try this at home), sulfur & honey are mixed and poured in a glass, which is rubbed on a black cat before the mixture is slowly sipped. Today our black cat is strong and healthy and a beloved member of the family. And upon the other places two. On the victim of her hoodoo. And leave it there to hang. Take bristles of a ritual hog. To protect you from the fog. You simply lack good fortune. And carry it as your talisman. Image taken by Brian Page. The cold or the abuse? Cooper pondered as she watched life unfold outside through a closed window. Technically the cold IS abuse, though probably not as severe as the abuse I’ve suffered at His hands. I do love the human children. I don’t wish to leave them. However, I am beginning to fear them too. They have learned too much from the monster they call Dad. Cooper’s decision was made. She would leave. She was no stranger to the outside world. She enjoyed hunting for food and fighting for fun. Predators that stalked her in the cover of night were the only reason she ever returned to His home, to His abuse. She would find a safe haven, something to protect her from cold and shelter her from darkness. It’s unseasonably warm, Cooper noted. It was a good thing too. The days were getting longer, but the nights were still brutal. Her coat had already begun to molt for the season. She needed time to adjust to the climate. She would use the warmth of the day to first find a place to rest. Her good fortune continued when, right across the street, she discovered a seemingly abandoned garage with a broken window. Purr-fect, she concluded. Upon sneaking through the damaged window, Cooper discovered a litany of supplies. This garage may have been dilapidated but it certainly wasn’t abandoned. Less than ideal, still it would do nicely. She explored boxes until she found one filled with old blankets and children’s clothes. She had never curled up in a more comfortable bed. Cooper drifted off that night pleased with herself. She was lonely but comfortable, hungry but safe. Tomorrow she would hunt. After a long slumber, free of drunken yelling, crying children, unprovoked kicking or tail pulling, Cooper arose with a stretch. She climbed into the window sill to sit briefly and absorb the morning sun. A rumble in Cooper’s stomach interrupted her meditation. She turned to set out on her mission for food when she realized she was being watched. In the distance she saw a human female holding a small black machine over her eye. Occasionally the human would push a button and the machine would click. Interesting. Cooper knew adult humans. They are mean. They are unpredictable. They have food. Engaging this human was a future option. However, for now Cooper wished to pursue her newfound freedom. She descended from the window sill, bolted through the back fence, and disappeared down an alley in search of food. Cooper spent much of the day cautiously surveying her new surroundings. There were many dangers. She needed to learn her escape routes. The cats native to these streets did not welcome her. Quite the opposite, they considered her an intruder. More than once she stalked her prey only to be run off by a flailing human before she could pounce. Massive, loud boxes of metal in all colors and sizes tore down busy streets on large rolling circles. She was horrified by the number of corpses she encountered, the victims of those metal monsters. The sun is beginning to set, she observed. It’s time to return to safety. As Cooper crept through the yard she witnessed the human female exiting the garage. Oh no, she panicked, where do I go if it’s no longer safe? She waited in the shadows long after the human disappeared. She proceeded cautiously through the window and was relieved to find herself alone there. What is that smell? Cooper made her way toward the door and realized that the human had left two bowls behind. Food and water. She was beginning to like this human. Cooper huddled in and ate every crumb. When she was done she yawned and stretched, time for a nap. That food would certainly hold her over until she could hunt again later. Eating food left by the human at night and soaking up the sun under the human’s watchful eye in the morning became staples in Cooper’s new routine. That is, at least, until He returned. One morning after basking in the glorious sunlight, Cooper began down the path toward the gate. She had just emerged from beneath the fence when she was viciously grabbed by the neck. NO! Cooper fought against His grasp. Let let me go! She hissed and bit. She swiped and slashed. They were right outside the human female’s window. Make more noise. She began to howl. As He carried Cooper away by her neck she heard it, BANG BANG BANG. The human was pounding on the window. “Hey! You let him go! Put him down! Don’t carry him like that!” But He ignored the human’s pleas. He never turned. He never slowed. He scurried away from the concerned human like the cockroach He was. He charged through the door and launched Cooper across the room. She scampered away and hid in the dark corner under His bed. She found comfort in the memory of her shortlived freedom. She thought back to the dismay in the female human’s voice as she plead with Him to release Cooper. Wait. Did that human say “him”? The human thinks I’m a boy. She was amused by this. The human mistook Cooper’s tough resourcefulness for masculinity. A female of any species should know better than to make such assumptions. I will befriend her, let her get to know me. I just need to get out of here again. It would take longer than expected to find the opportunity to execute another breakout. The children were gone now. Cooper had no idea where they went. Their belongings were untouched, but they were absent, no longer there to leave doors wide open. He had become cautious about closing the door. He wasn’t going to make this easy for her. She would have to be aggressive. She waited crouched by the door. As soon as this door opens, I run. Soon He returned home in a stupor. She executed her plan flawlessly. His altered state prevented Him from recapturing her this time. She quickly crossed the street, escaped the streetlight, and disappeared into blackness. She remained concealed for a short time until she heard voices. Humans? She wondered. She approached the yard with caution. Two of them. It’s a risk. I want to return to the garage but I need a better place to hide from Him, especially now… She let out a faint meow. The humans turned to her but did not approach. Cooper was relieved. The female knelt low and extended her hand. Cooper advanced with care. The humans waited patiently and the female coaxed Cooper along. When Cooper was within reach the female human gently caressed her head, scratched behind her ears, and stroked her back. She removed the collar that Cooper had worn since she was a kitten. He never once loosened it, even as Cooper grew. It had become a choking reminder of the mistreatment she’d endured. This human truly freed me. Cooper had never been around one so gentle and quiet. The male human opened the door and stepped aside, as if to welcome Cooper into their home. She wasted no time. She darted through the door and began to explore her surroundings. I need a safe place, just in case. She found a bedroom empty except for a bed. She navigated the maze of boxes and books beneath it and discovered the perfect cove in which to hide. “Where is he?” Cooper heard the male human ask. They still think I’m a boy. They will certainly be surprised by what I have in store for them. For the most part the humans left Cooper to adjust to her environment. They seemed sensitive to her plight. Cooper liked that about them. Well, that and the food. She was so hungry all of the time now. She ate and slept the days away. “He’s really filling out.” The male human called Brian once observed. “I’m not sure he’s a he.” The female human called Carrie replied. A couple of weeks passed before they caught on, “I was petting Cooper today and HER belly moved,” Carrie recounted to Brian. “No way, really?! ?” Brian was still in denial. He approached where Cooper lay in a strip of sunlight on the floor. “You got something in there for us, Coop?” He sat next to her and lightly pet her side. With a stunned expression Brian exclaimed, “I felt it too! Cooper is totally pregnant!” Cooper laughed to herself and dozed back off to sleep. “I think maybe four kittens” she heard Carrie say as she woke from her slumber. “Yeah, three or four” Brian agreed. The amusement just doesn’t stop with these two. Clearly these people have never had a litter of kittens. This should be fun. Carrie did manage to a decent job on a birthing box. Pillows, blankets, privacy, yes this will do. The Sunday the kittens made their arrival Cooper did not want to leave Carrie’s side. She was uncomfortable and quite nervous. Carrie is comforting, though maybe a little too excited about MY babies. Regardless, she would shadow her human throughout the day. Eventually it became clear that it was time to leave Carrie and settle into her box. I do wish they would stop looking in on me. Enjoying the show nosy humans? Cooper was irritated by the constant interruptions, particularly from the overly concerned Carrie. Though, as it would turn out, Carrie’s concern was justified. There were more than three or four babies, more than five or six even. Seven kittens were born and some so closely together that Cooper had little time to clear the sac from their faces and stimulate their breathing. A few had even become entangled within the blankets in the box somehow. 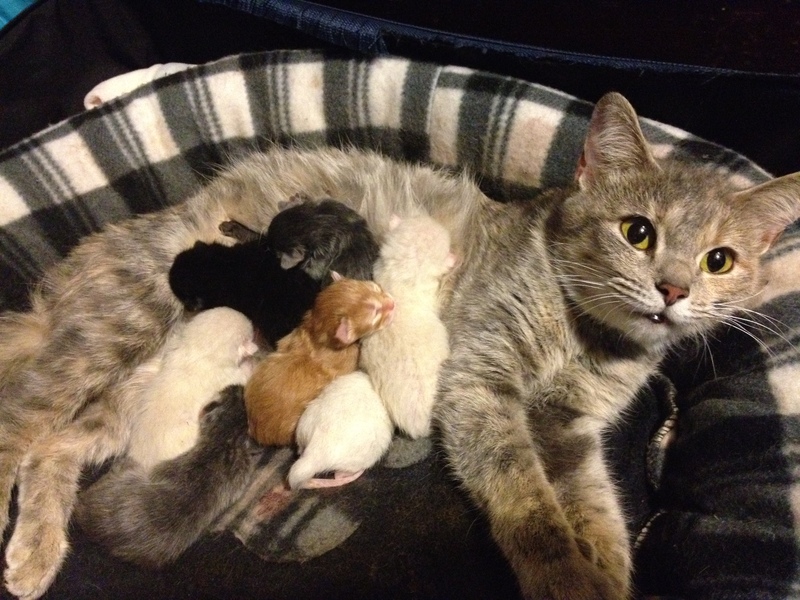 When Carrie looked in on Cooper for the final time that night, she carefully sifted through the blankets, placing each kitten onto Cooper’s belly, so the new mommy could tend to them properly. Seven ~ Ellington, Julius, Khan, Louis, Lola, Shojo and Voodoo. Three girls, four boys. This family who owned no cats just a few weeks ago now has eight of them. It’s a good thing they’re decent, for humans. SIDE NOTE: When the kittens were old enough to wean themselves naturally we began the re-homing process. Louis went first to my youngest son’s best friend’s family. He is now “Levi”. Lola followed. She went to live with my cousin’s family. Unfortunately Lola ran off while out playing with her new puppy brother and was likely picked up by another family. 😦 Khan was a birthday gift to my niece. My oldest son kept Ellington. My daughter kept Shojo. My husband and I kept Julius and Voodoo. Cooper went deeper into witness protection. She now lives with dear friends and is allowed to roam their expansive property at her leisure. She also gets lots and lots of affection when she wants to be inside around her new humans. Each and every one is treasured and loved by their respective families. I get regular updates on all, except for Lola, obviously. I like to think she’s living it up with a great family too.